Tonight's movie is not exactly a movie but rather the opening of the 2010 Vancouver Olympic Winter Games...three of us here tonight watching the teams come into the stadium at B.C. Place in Vancouver and wondering how the entire Olympics will go. It is an exciting time here in Canada although we are saddened by the loss in practice today of the young Luge athlete from Georgia. Unusual for me to feature a book on this blog, but it seems appropriate to highlight this one, The Complete Book of the Winter Olympics, 2010 Edition. Amazon, of course, has an interesting and fairly extensive line of 2010 Winter Olympic merchandise available, which you can visit by clicking right here. 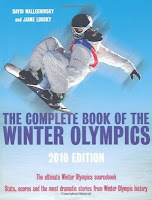 The Complete Book of the Winter Olympics, 2010 Edition. See Amazon's complete collection of 2010 Winter Olympics merchandise.